31.dec.2004 - In preparation for the new year, I updated the Freeware guide. Every few months, I go thru it and repair dead links. Surprisingly, most of the links were still valid. This tells me the programs listed there aren't going away anytime soon. Added a few proggies you might enjoy. Thx to those who sent linkz. The Rad Freeware page continues to grow in popularity. More people are learning that, in the world of software, free does not equal cheap. Indeed, some of the best software applications out there are Open Source, coded by teams of smart people who take great pride in their work, and ask nothing in return, except your feedback on how improvements might be made. If you venture out tonight, drive carefully. If you drink, don't drive .. so we can all continue to indulge our technolust in 2005 (hey, that rhymes). If you do plan on drinking, get really plastered .. no, just kidding. Rather, check out some tips on avoiding & surviving hangovers (blogged from last year). 2004 has been rad. See ya next year. Happy New Year from Syria! 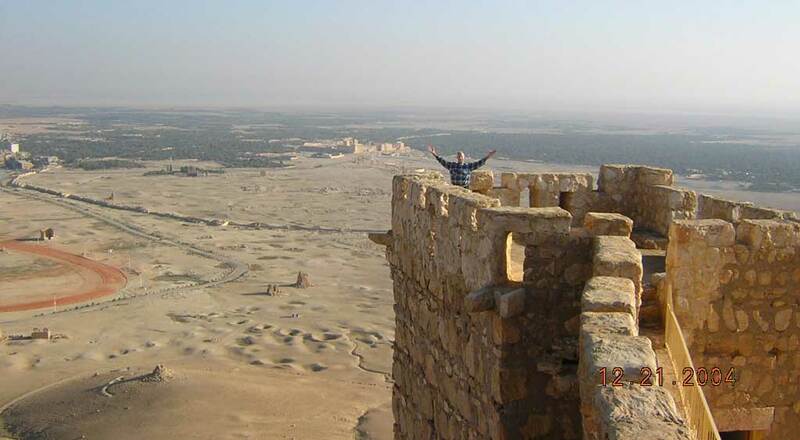 The attached photo (I apologize for the long download time, no editing software nearby) was taken atop an Arab castle overlooking the ruins of Palmyra, here in the Syrian desert, ~half way between the Mediterranean coast (to the west) and Iraq (to the east). I've been warned not to venture further east as the Mujahideen would enjoy taking me on a one-way, all-expenses-paid trip to Baghdad, where they would receive a handsome bounty for any American or native of a coalition-member country. If you see me on the evening news, wearing one of those stylish orange suits, you'll know I wandered too far east. Some of the other tourists didn't know about the camera and gave me funny looks. Palmyra was interesting and great fun, but I must be moving on. two old friends setting off on a wine-tasting road trip .. only to veer dizzily SIDEWAYS into a wry, comedic exploration of the crazy vicissitudes of love and friendship. .. but the reviews were strong. In fact, few films rated higher. Sideways falls into the Roadtrip genre, like Thelma & Louise. I really wanted to see Meet the Folkers, but Sideways has been out for a while, and I didn't want to miss it before it went away (especially since reviews were so high). 26.dec.2004 - Hope ya'll had a merry Christmas. I came home Xmas eve to find the normally-invincible Rad Rig locked up (that never happens). Restarted fine. Christmas morning, it took several tries to get 'er up and running (not a good sign). Today, the system wouldn't boot at all (ugh, you know that horrible feeling). Kept getting the dreaded Blue Screen of Death, with error > DRIVER_IRQL_NOT_LESS_OR_EQUAL specifically mentioning IdeChnDr.sys. This is one of the drivers that's part of the Intel Application Accelerator for the IDE controllers (both Primary & Secondary). 23.dec.2004 - Back in May of last year, I installed v2.63 of MovableType blogging software (touted as the world's best). With no compelling reason to, I never upgraded this installation for fear of screwing it up and losing all those entries. An error occurred while loading data: Table 'mt_author' already exists at mt-load.cgi line 195. First check if there are any authors or blogs currently--if there are, don't run the rest of the script, because we don't want to add the default author back in (hack). Looks like I'll have to set up a new database and see what happens. Guess it would be too easy for everything to work perfectly the first try. UPDATE: Hey, it worked. The new blog still needs to be dialed in, but it's working (with its own database). 21.dec.2004 - Winter solstice today (here in the Northern Hemisphere, anyway). The day with the least hours of daylight. After today, each day will get a little longer, until the earth arrives on the other side of the sun, sometime in June (summer solstice). The long hours of darkness can cause some folks to feel depressed this time of year, which marks the first day of winter. Here in Laguna, I'm sure there will be some nature-lovers drumming on a hillside somewhere around sunset. More solstice info posted here. 20.dec.2004 - Saw The Aviator last night, a biopic, similar to Ray, about the life of Howard Hughes, starring Leonardo DiCaprio. It's been getting rave reviews. Actually, I liked Ray a little better, maybe because I had such high expectations going into see The Aviator, and low expectations for Ray. Both movies, coincidently, begin and end with their mothers. 18.dec.2004 - Painting today. There's something therapeutic about choosing a color and painting a room with a fresh coat. We picked baby-blue for the master bedroom. Actually, I think the official name is ocean blue. Seems appropriate since we're so close to the ocean. All we need now is a painting of Crystal Cove to hang on the wall there. 17.dec.2004 - Happy birthday to Nikolas and Nikolai (Nik-n-Nik, as they're known). They are 13 and 15. Their b-days are only days apart. I went over there last night to sing happy birthday and devour some Baskin-Robbins chocolate ice-cream cake. Afterwards, we sat around while Maria told the stories of when the kids were born (22 hours of labor, no drugs). I miss the days when we all lived together at the big house (see previous entry: dated 16.December). In more geeky news, the boys at Google have undertaken a massive project (called Google Print) to scan the books from five libraries (Harvard, Stanford, University of Michigan, Oxford & the New York Public Library) and put them on the Internet. 16.dec.2004 - Speaking of enjoying events here in the OC (see previous entry: dated 13.December), friends asked me to mention <plug> their vacation rental, known simply as The Big House. I lived there myself for a kouple of years, so I kan vouch for how sweet it is. The view is nothing short of spectakular. Terraced gardens. All on a private road. I'm trying to konvince them to konvert one of the (6) bedrooms into a gaming room [we kan kall it The Rad Room], where we would kram a bunch of awesome gaming komputers, such as those featured at Alienware or GamePC, all networked to a Rad gaming server .. for some blazingly-fast (and highly-addictive) LAN play. 13.dec.2004 - This week is the 96th annual (since 1907) Christmas Boat Parade in Newport Harbor. Those of you who live here in SoCal know how cool it is. Festivities "get underway" (literally) Wednesday (the 15th) and conclude with the grand finale Sunday night (the 19th). Parking and traffic are always a mess, so it's best to arrive early and dress warm. It's even better if you know someone who lives on Balboa Island. I like to ride the (3 -minute) Balboa Island Ferry over. If you've read the novel The Golden Orange by Joseph Wambaugh [ex-Los Angeles police officer, who wrote The Onion Field], you know he begins his story with the (drunken) captain of the Balboa Island Ferry crashing his vessel into lighted yachts during the Christmas Boat Parade. 12.dec.2004 - Here's a bit of software every good geek should know about: BitTorrent. I've mentioned it before, and even included it on my Freeware page, but it's becoming more popular [see here: File-sharing network thrives beneath the radar and here: 'BitTorrent' Gives Hollywood a Headache] now that the US Supreme Court has decided to hear a case on file-sharing that deals with Peer-to-Peer (P2P) networking software such as Grokster, Morpheus (made by StreamCast) and Kazaa. BitTorrent is different in that it breaks up large files into smaller constituent parts. You then download these smaller parts from different computers around the web and re-assemble them on your machine. Pretty clever idea if you think about it. The file-sharing companies will be represented by the Electronic Frontier Foundation, which represented StreamCast (makers of Morpheus) in the MGM vs Grokster case (in Los Angeles Federal court). It'll be interesting to see how this one turns out. Many geekish eyes will be watching, since so many of us share files. Related linkage at Forbes,.. TechCentral,.. NY Daily News,.. NY Times,.. Reuters,.. Bloomberg,.. CNET. The debate rages at SlashDot. 09.dec.2004 - When I mentioned "heading north" (04.December), I meant "north", as in North Laguna, as in moving there .. from South Laguna, that is. In other words, we moved ~3 miles north, up Pacific Coast Highway, closer to Newport Beach and Crystal Cove, and the Big Newport ("biggest screen in the West"). Walking distance from Shaw's Cove and Heisler Park. I've moved twenty-something times since I was 18 years old. It makes my head hurt to count them all up (Florida, Maine, Pennsylvania, New York, Hawaii, Connecticut, Washington state, Illinois, Guam, Idaho, California, etc). Heck, I remember walking around a shopping mall one time, and forgetting what state I was in (Pennsylvania). People look at you mighty weird when you ask them, "Excused me, can you tell me what state this is?" Anyway, this new place is nice .. altho not as nice as the last place. Lots of cool plants here. Giant plants. Has a jungle feel to it. My new neighbors are yoga instructors, shrinks, and writing teachers at UCI. Haven't met the rest yet. Buddy & Fran have been on the prowl, checking out the new neighborhood, peeking in windows. Lots of other cats live around here. Good rodent control. The remainder of today's entry is blogged here: Moving to North Laguna. 04.dec.2004 - Heading north this weekend. More later. blog noun [short for Web log ] (1999) : a Web site that contains an online personal journal with reflections, comments, and often hyperlinks provided by the writer. That's a pretty good definition. I've been "blogging" for a while now, since back before I knew there was a word for it. In May of last year, I installed software specifically designed for this purpose. Most agree that MovableType is the best blogging software out there, although it can be tricky to install. My MovableType blog is posted here: Ye Olde Rad Blog. I use it primarily for longer entries, such as this one: Blog = Year's Top Word.